As you might have heard by now, a tectonic shift has occurred within the hallowed halls of the venerable film magazine Sight & Sound. Vertigo has replaced Orson Welles’ cinematic PhD dissertation, Citizen Kane, for the Number One slot on the monthly’s list of 50 Greatest Films of All Time. Finally, they’re seeing things my way. And for the last day or two the Internet has erupted with either rejoicing or indignation—depending on your loyalties to either Hitchcock or Welles. “Greatest 50” lists of any kind are more arbitrary and capricious than a Philistine god. In fact, the very notion that works of art can be herded into a police line-up and organized from greatest on down is not supported by any aesthetic or critical theory that I know of outside Nazi Germany or Soviet Russia. Art is art and it simply defies competitive ranking. But you already knew that, so let’s get on with why I think this is important—especially for Hitchcock fans. When Vertigo was released in 1958, press and public alike didn’t know what to make of it and their ho hum response hurt Hitch personally. Ultimately, it may have contributed to his inability to gather support for another pet project that touched on the supernatural: Mary Rose. He knew he had a major work of art on his hands, but timing—and mishandling on the marketing distribution end—worked against him. A couple of years after Vertigo’s ill-fated run, Psycho screenwriter Joseph Stefano confessed to the director that the film was, in his opinion, Hitch’s greatest film. As recounted in Stephen Rebello’s Alfred Hitchcock and the Making of Psycho, Stefano’s praise actually brought the director “to near-tears.” Still, by 1962, Hitch was so shaken up by this film in which he had invested enormous artistic juice that he could hardly bring himself to talk about it in his interviews with Francois Truffaut. In 1973, he pulled the film from circulation altogether. As the years passed, critical reception improved. You can literally chart Vertigo’s ascension to critical esteem by looking at its rise in ranking on various lists, such as the Sight & Sound list above. It first appeared on the list in 1982, on the number seven spot. It moved up to fourth place in 1992, second place in 2002 and finally took first Place in 2012. A similar trajectory can be observed in the American Film Institute’s 100 Years… 100 Movies list and various others. But the Sight & Sound list, which compiles the votes of over 800 critics, is by far the most respected. And so, when Citizen Kane, which held the top spot since 1962, was moved down a notch, well, you can see why some people think it's kind of a big deal. For the last few years, Vertigo and Citizen Kane have jostled for First Place on a variety of lists. And for good reason. Both films are deeply personal works by two genius directors working at the top of their game. And both feature main characters who, caught up in their obsessions, behave badly. Charles Foster Kane is played by Orson Welles, while Scottie Fergusen (James Stewart) is a clear stand-in for the obsessive Hitchcock. 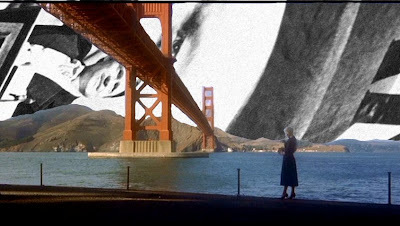 While both films are masterpieces, I have to say that Vertigo has an edge over Welles’ film. Kane’s pre-eminence is due in no small part to Gregg Toland’s expressionistic cinematography, supported by Bernard Herrmann’s score—along with a cast of first-rate actors. Still, the story itself adds little to the body of filmic literature. (In fact, the story is told mostly through the eyes of a newspaper reporter.) For me, once I figured out the game that Welles was up to, I found that there’s not much more that it has to say. Welles’ background was in live theater and radio. He only brought a handful of film projects to completion, and while each one is brilliant and amazing, but I always got the feeling that he was throwing the kitchen sink at his audience in terms of production and technique crazy creative ideas. What you see with Welles is all he ever had to offer. Hitchcock was different. With a background exclusively in film, his Vertigo is the summation of several decades’ deep experience and meditation on film. The result is a project that is profoundly sublime and complex. I get the feeling that Hitch had much more to say, but that he had the restraint to leave it for another time, another movie. Plus, while Citizen Kane is all shadows and corners and angles, with an ugly man at its center, Vertigo is flat-out more beautiful, a Technicolor portrait of one of America’s great cities, with the exquisitely beautiful Kim Novak dangled before our eyes. I mean, seriously, what you rather spend an evening hanging out with: Madeleine’s mesmerizing legs or Charles Kane’s preposterous jowls? With all the bluster of its eponymous gubernatorial candidate, Citizen Kane proclaims itself to be a Great Work of Hollywood Art from its first frames. Vertigo, on the other hand, simply spins a good, albeit twisted, yarn. Along the way, Hitchcock made history, using filmcraft at its best to tell that story and draw the audience in. And that helps explain its rise in stature. As Sight & Sound's editor, Nick James said in a CNN interview, among critics there has been a trend away from "films that strive to be great art, such as Citizen Kane, and that use cinema's entire arsenal of effects to make a grand statement" toward those with "personal meaning to the critic" as in Vertigo. Reflecting on his unique set of first-world problems, Hitch was fond of complaining, "My movies go from failures to masterpieces without ever being successes," and, "Even my failures make money and become classics a year after I make them." The same could be said of his entire body of work. In Hitch's day, his films were generally regarded as mere thriller entertainment (French critics aside). Since then, his oeuvre has been assessed and reassessed by new generations of audiences--and each time his stature rises. Vertigo's recent placement at the top of the Sight & Sound list is the latest affirmation that Alfred Hitchcock is indeed the Shakespeare of the 20th century. But maybe you feel differently. Drop me a line in the comments section and tell me what you think. Which of the two movies do you think ought to occupy first place? Thrilling and validating! Everyone who has been a follower of Hitchcock always knew this. Even when the film was released, somebody must have believed this to be a work of genius. After all, the words on the original release movie posters are "James Stewart Kim Novak in Alfred Hithcock's Masterpiece Vertigo"
Joel, your commentaries are always insightful genius. You are by far the best Hitchcock writer today. You often express what I feel about Hitchcock films but cannot always verbalize. Thanks for your brilliance. Thanks for the reminder about the poster! That might be the biggest indication that Hitch was consciously shooting higher than anyone realized at the time. Thank you for your kind worda as well. I have loved this film since I was about 8 years old and secretly enjoyed that most people, especially critics, disliked it so much! But it is nevertheless a masterpiece which I will always watch if on television, despite owning three copies and having watched it about forty times! Each time I watch it I find a new flaw but I will love it forever despite and because of these flaws. My biggest fear has always been someone may try and remake it. I would be livid! While Vertigo also echoes Hitch's own obsessions as a director, it is also metaphor for the Hollywood studio system and it even can be read as a philosophical treatise on the meaning of film itself. Hey, I just found this post and was wondering if you were referencing any literature that develops this point. This blog is great, I'm glad I stumbled across it.